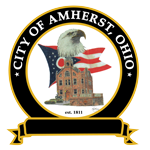 Amherst City Council is comprised of seven members, plus the Council President, each serving a two year term. The Council Clerk is appointed by council. Committee meetings take place every first and third Monday of the month with additional meetings scheduled on Tuesdays if needed. All meetings are held at City Hall, 206 S. Main Street.